Photographed in the Plomosa Mountains, La Paz Co., Arizona. 01 March 2009. FLOWERS: February-March. Four bright yellow petals. Eight stamens and four branches to stigma. Unopened flower buds nod downwards. RANGE: Western portions of the Sonoran Desert in Arizona and ranging into the Mojave Desert of California and Nevada. ANNUAL: Low, herbaceous annual with most of leaves basal, i.e. at ground level. 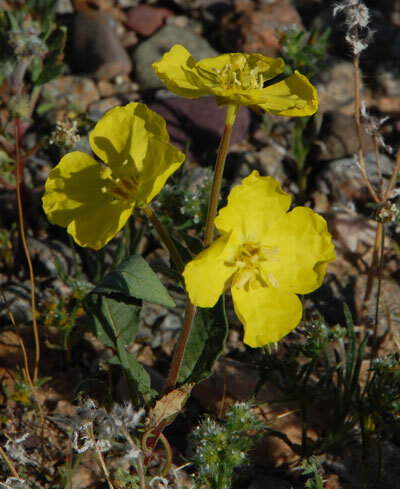 Growing from desert pavement and rocky slopes, the plants are rarely taller than 15 cm. FRUIT: Dry, cylindrical capsules develop below the flower and are about ½ cm long. LEAVES: Leaves are elongate and may be partially divided by deep marginal teeth.